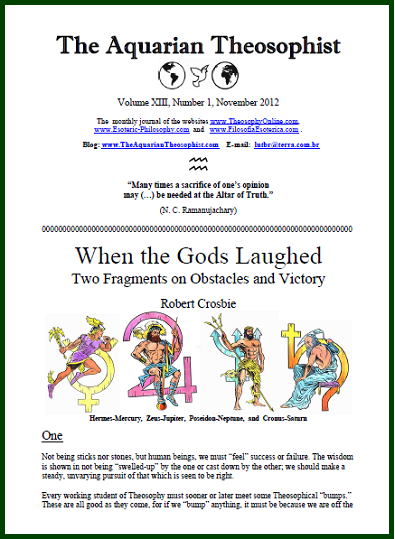 In the first article, “When the Gods Laughed”, Robert Crosbie shows us that there is much to smile at, as the theosophical effort goes on. It is always good to laugh at our own sufferings, especially after they are overcome; and it is only ignorance that blinds us to the inner happiness present in life. On page 2, a warning for our readers to save money: in spite of its promising title, a new book about H. P. Blavatsky can hardly be useful except as raw material for recycling paper. On pp. 3-7. Robert Kitto writes from Britain and examines our long way from Aspiration to Initiation. Have we asked ourselves – where the path begins? “A Sacrifice in the Altar of Truth” is the title of a short, insightful article at p. 8. It is signed by one of the main Adyar Society authors, Dr. N. C. Ramanujachary, who lives in India. A lesson of timeless wisdom comes to us from ancient Rome, and can be found at pp. 9-10. It is the transcription of a lecture delivered by Musonius Rufus, on the reasons to disdain the hardships one must face. Musonius was Epictetus’ Master. On pages 13-16, we have two transcriptions of radio talks by Albert Einstein on the Jewish people. The first address was made in 1939, as the Holocaust was about to begin. The second radio talk took place in 1949, shortly after the creation of the State of Israel. Einstein’s words give us glimpses of one of the main tragedies in recent centuries: anti-semitism. He also points out the solution: friendship and mutual help between Arabs and Jews, as part of a wider brotherhood among all nations. The November edition includes a couple of inspiring quotations from an Indian theosophist, Mr. B. P. Wadia.